I’ve got friends in all sorts of churches—and they love and follow Jesus with all they’ve got. God is doing a lot of great things in a lot of churches, churches with different denomination labels—or no labels at all. 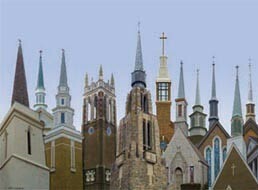 I’ve been in many of these churches and love the way they worship, lift up God’s Word, and point to Christ. But there is one thing unique about Southern Baptists, and it remains a defining reason why I choose to serve in and through a Southern Baptist Church. You give to your church, but your offering does not by itself pay the pastor’s salary, purchase beds for the church nursery, or buy doughnuts to keep the youth group on a sugar high. Your money is joined with the gifts of others in your church. You work together to support and provide what needed. Together, we can do more. Now look at that from the church level. With the host of needs in our communities and throughout the world, what can one church do? We do what we can, but resources are limited. But what would happen if churches worked together, cooperated, and pooled their resources to fund ministries and mission endeavors? Together, we can do more. … support thousands of missionaries and mission efforts in the US and around the world. … provide immediate disaster relief. … fund the training of seminary students. OK, this cooperation supports a lot more than that, but you get the idea. And because we pool our resources, the men and women in these various ministries do not have to go from church to church pleading their case and asking for funds. I have family who serve as missionaries with a non-Southern Baptist mission agency. My relatives are doing great work, and the mission organization they work with is a solid, Christ-honoring group. But the missionaries also have to spend time raising support. They must seek out support from individual Christians and individual churches. CP Missions, the cooperative effort of Southern Baptists, makes it possible for missionaries to get on the field and serve—fully supported from day one. I will continue to give generously to my church because I am joining forces with thousands of other Christians. My giving is making a difference. This post supports the study “Give Money Generously” in Bible Studies for Life. Previous Previous post: What’s in Your Attic?